Click on 'Check solution' when you finish the puzzle (it will flash to remind you). This submits your time and lets you rank the puzzle - it doesn't close the window so your solved puzzle won't vanish. Placing pencilmarks is useful for helping to keep track of which numbers can fit into a particular square. Clear squares: Press '0' or 'delete' to empty a square, or press a number key again to toggle a pencilmark or solution digit on and off. Undo/Redo: You can 'Undo' every move right back to the very start of the puzzle, and then 'Redo' back as far as you like using the buttons or by pressing 'Z' and 'X' respectively. Save game: Click this button to save your game state, including pencilmarks. Next time you open this puzzle from the menu it will re-open at exactly the same position. Reset puzzle: Use this button to empty the puzzle. If the game position was loaded from a saved state then you are asked whether you want an empty puzzle or to return to the previous saved state. Double-click a square if there is only one pencilmark in it and it will be automatically converted to a full-size solution digit. Resize the player window and the puzzle will rescale to whatever size you make your window, no matter how large or small! The selected square will wrap around the edges of the puzzle if you move off one side. Give up: If you click on 'Give up & show solution' then the solution is revealed complete with red digits for numbers you did not solve and black ones for numbers you did. Your incorrect solution digits are shown in small green numbers in the corner of each square, which lets you see where you went wrong - if you did! You are also given the chance to rank the puzzle, based on how difficult you were finding it. You can also tab or shift-tab between squares if you find this easier. Click on the highlighted selected square if you want to remove the highlight. Show repeated digits will highlight in red any solution digits you place which are repeated within a row, column or jigsaw region. All marks will fill every unsolved square with all pencilmarks. This is only useful if you like to solve by eliminating pencilmarks, rather than adding them as you progress. Valid only will add all valid pencilmarks based on adding all marks and then eliminating those which are already placed as a solution digit in the matching row, column or jigsaw region. This is often a shortcut to solving a puzzle. Remove now will remove any pencilmarks that are invalid based on solution digits already placed in rows, columns or jigsaw regions. Auto-remove applies the 'Remove now' operation automatically after every solution digit added to the puzzle. Show wrong moves consults the solution to the puzzle and highlights solution digits that you place incorrectly into the puzzle. They are italicised and also glow in purple (Internet Explorer) or are underlined (all other browsers). 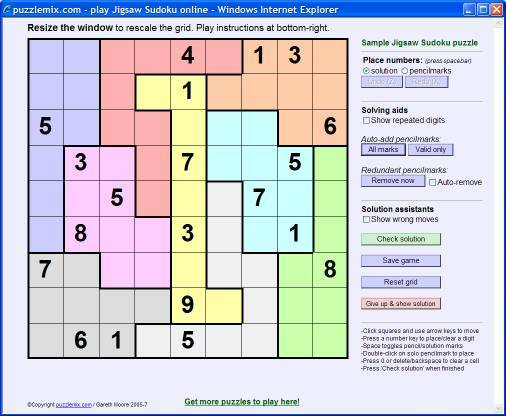 Check solution will tell you how many unsolved and incorrect squares you have in the puzzle, unless you have solved it successfully in which case it will log your completion time and pop open the puzzle ranking and comment window.